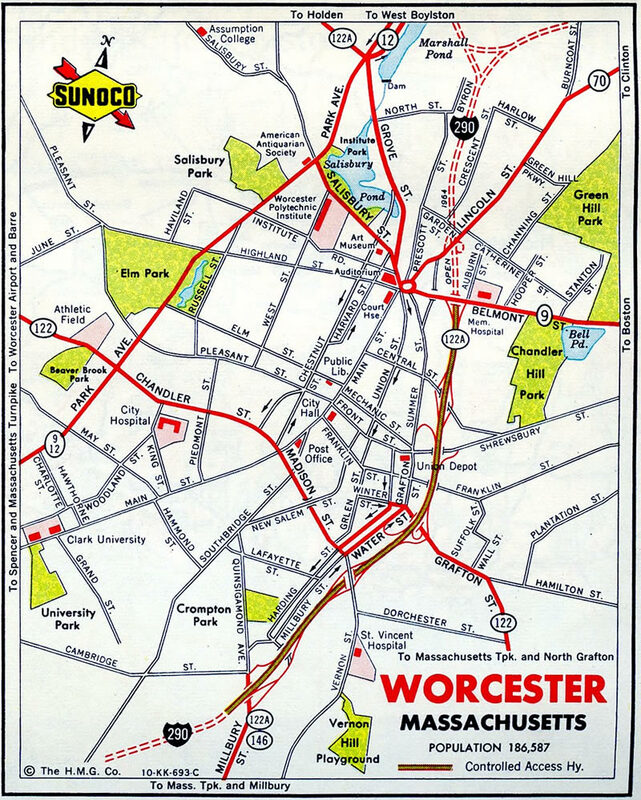 Interstate 290 forms a loop connecting the city of Worcester with the Mass Pike (Interstate 90) to the south and Interstate 495, the outer beltway for Boston, to the east at Hudson. The western end of I-290 shares a terminal point with Interstate 395 north from Connecticut. Interstate 190 stems north from the turn of I-290 from the leg through Worcester and the east-west portion to Shrewsbury, Northborough and I-495. Construction of I-290 at the eastern terminus included a stub beyond the full cloverleaf interchange linking the freeway with Interstate 495. This changed by the mid-1970s with construction of the Route 85 Connector. The connector leads east from the end of I-290 to Massachusetts 85 at Technology Drive. As part of the work to build the expressway spur, the loop ramp from I-290 east to I-495 north was replaced with a sharp left side ramp. 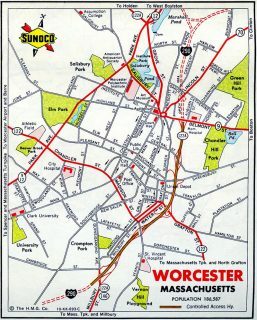 The early proposal for Interstate 290 looped the freeway southeast from Worcester to an end at the cross roads of Interstate 90 (Massachusetts Turnpike) and I-495. The first sign for the east end of I-290 precedes the six-ramp parclo interchange (Exits 25A/B) with Solomons Pond Road. Photo taken 06/28/05. Exit 25B loops onto Solomons Pond Road north two miles ahead of I-495. Solomons Pond Road connects with River Road and Donalyd Lynch Boulevard, a north side frontage road leading to Solomon Pond Mall and other big box retail. Photo taken 06/28/05. The right lane defaults onto Interstate 495 southbound toward Milford, Franklin and Mansfield. 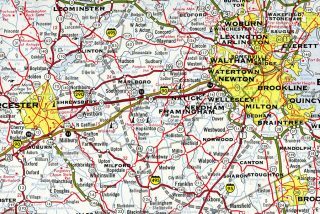 The beltway travels seven miles south to I-90 (Mass Pike) and 65 miles to I-195 / Route 25 at Wareham. Photo taken 06/28/05. A left exit joins Interstate 495 north to Lowell, Lawrence and Haverhill. This ramp replaced a previous loop ramp to the right. Photo taken 06/28/05. Exit 26B leaves Interstate 290 eastbound as the freeway transitions into the two-lane Hudson Street connector. I-495 arcs 55 miles northeast and converges with I-95 at Amesbury. Photo taken 06/28/05. Continuing east along the Hudson Street connector to Fitchburg Street and Massachusetts 85 (Washington Street). Fitchburg Street travels south to Marlborough while Washington and Broad Streets head north from Hudson Street to Downtown Hudson. Photo taken 06/28/05. Hudson Street westbound at the jughandle with Fitchburg Street and the connector to I-290 and I-495. Fitchburg Street heads southwest to Pleasant Street and Marlborough Photo taken 06/28/05. The Hudson Street connector advances 0.9 miles west from Fitchburg Street to the directional cloverleaf interchange with Interstate 495. Photo taken 06/28/05. Exit 26B departs the Hudson Street connector for Interstate 495 northbound in one half mile. 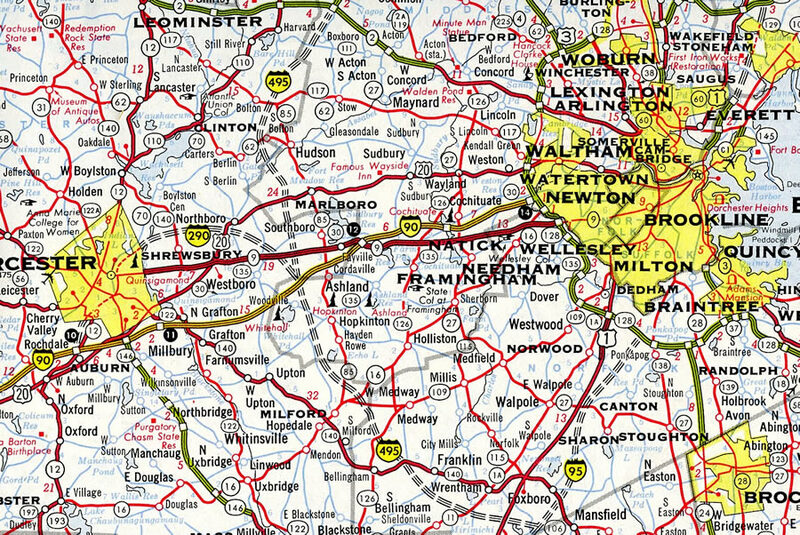 I-495 loops northeast 26 miles to the Lowell Connector and U.S. 3, and 36 miles to Interstate 93 near Lawrence. Photo taken 06/28/05. Interstate 290 westbound begins as Exit 26B leaves for I-495 north. The succeeding ramp joins Interstate 495 south to Franklin, Taunton and Cape Cod. Photo taken 06/28/05. Traffic separates for I-495 south and I-290 west. Worcester lies 14 miles ahead, while I-495 meets I-95 in 33 miles. Photo taken 06/28/05. Interstate 290 begin shield posted by the Bigelow Street underpass. Photo taken 06/28/05. Two miles south of Interstate 290 west and the Route 85 Connector east on I-495 north at the full cloverleaf interchange (Exits 24A/B) with U.S. 20. U.S. 20 parallels I-290 west through the town of Northborough. Photo taken 07/29/07. Interstate 495 turns northwestward on the one mile approach to Exit 25A for Route 85 Connector east to Hudson and Exit 25B for I-290 west to Solomon Pond Mall and south Berlin. Photo taken 07/29/07. The Route 85 Connector constitutes a controlled access expressway extending east from Interstate 290 to Fitchburg Street, Massachusetts 85 (Washington Street) and Technology Drive. The connector opened in the mid 1970s. Photo taken 07/29/07. A loop ramp joins Route 85 Connector west as it transitions to Interstate 290 west. I-290 reaches Downtown Worcester in 14 miles. Photo taken 07/29/07. A pair of signs notify motorists of the designation change from I-290 westbound to I-395 southbound ahead of the Mass Pike over crossing. Other instances in the Interstate system where two routes conclude at the same location include I–195 and I-495 at Wareham, Massachusetts and I-64, I-264 and I-664 at Suffolk, Virginia. Photo taken 06/28/05. A lane drop occurs along I-290 westbound at Exit 7 for the Mass Pike access road. Exit numbers along I-395 continue the sequence of I-290 south from U.S. 20 at Auburn to the Connecticut state line. Photo taken 06/28/05. Following the Mass Pike access road from I-290/395, motorists partition with a loop ramp to Route 12 (Southbridge Street) north before curving northward to Interstate 90. Photo taken 06/28/05. Exit 6B departs I-395 north for U.S. 20 (Washington Street). Exit 7 follows to Interstate 90 (Mass Pike) by way of Route 12 (Southbridge Street) south and a nearby access road. Photo taken 06/28/05. Exit 7 loops away from I-290 eastbound to Route 12 (Southbridge) south to the Massachusetts Turnpike. I-290 advances north 11 miles to I-190; Route 12 merges with U.S. 20 through West Auburn. Photo taken 06/28/05. Interstate 90 (Massachusetts Turnpike) enters the town of Auburn ahead of Exit 10 to Route 12 (Southbridge Street), I-290 east and I-395 south. Photo taken by Douglas Kerr (02/00). The Mass Pike access road links Exit 10 with ramps to both Route 12 (Southbridge Street) and I-290/395. Route 12 winds along a commercial strip west to connect with U.S. 20 ahead of West Auburn, Charlton and Sturbridge. Photo taken 06/28/05. A loop ramp follows from the Mass Pike access road onto Route 12 (Southbridge Street) northbound. Route 12 parallels I-290 north from Auburn to Worcester. U.S. 20 parallels to the south, meeting I-395 at a nearby cloverleaf interchange. Photo taken 06/28/05. U.S. 20 switches sides with Interstate 90 (Mass Pike) on the south side of Worcester. The toll road advances two miles west from the crossing to Exit 10 with I-290 east, I-395 south, and Massachusetts 12. Photo taken 06/28/05. Interstate 90 (Mass Pike) crosses over Route 12 (Southbridge Street) and Interstate 290 ahead of Exit 10. I-290 travels north through Worcester while I-395 extends south to Oxford. Photo taken 06/28/05. Worcester Expressway (I-290) (Boston Roads). Page updated September 19, 2016.